In order for two substances to be miscible, or in order for one substance to be soluble in another, the two kinds of molecules must interact with each other. Not only that, but there must be strong enough attraction of one type of molecule for the other so that they are willing to move away from their identical siblings. If the attractive forces between the unlike molecules are strong enough to overcome those forces between both sets of like molecules, dissolution results. Table salt dissolves in water because the very polar water molecules attract both the positively charged sodium ions and the negatively charged chloride ions. This interaction is called an ion / dipole interaction. In order to distribute the sodium cations and chloride ions throughout the solution, some of the water molecules may need to back away from each other to make room for the ions. Some of the strong hydrogen bonds may be lost, but the energy needed to overcome those interactions is compensated by the attraction between the dipole of the water and the sodium or chloride ions. Other salts dissolve in water, too, but some of them dissolve more easily than others. You could easily dissolve about 360 g of table salt in a liter of water, but the solubility of calcium carbonate is only about 0.01 grams per liter. That's partly due to the fact that the ions in sodium chloride, Na+ and Cl-, have lower charges than the ions in calcium carbonate, Ca2+ and CO32-. The higher the charges on the ions, the stronger their electrostatic attraction for each other, and the harder it is for the water to pull them apart. It's a good thing, too; if the calcium carbonate in marble were to dissolve too easily, think of how many buildings and statues would dissolve in the rain. The factors that control the solubility of ions can be complex, though. For example, the charges on the ions also affect the strength of the interaction with the water molecules. Highly charged ions interact more strongly with each other, but they also interact more strongly with water molecules. There are other solvents that can dissolve salts via ion / dipole interactions. Typically they would have strong dipoles. However, not many solvents have dipoles as strong as that of water. 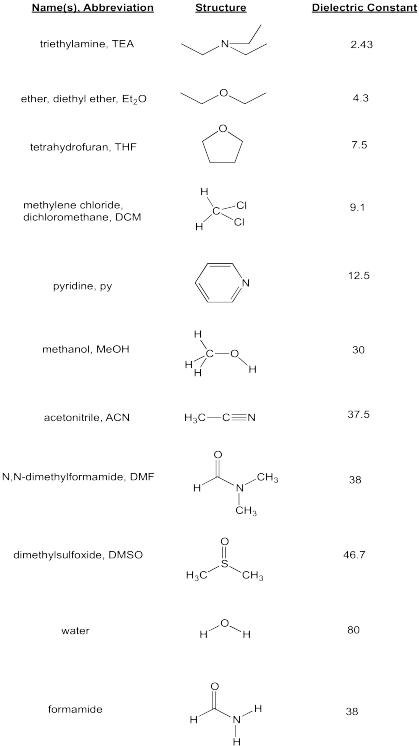 Which of the following solvents would be most capable of dissolving some LiCl? Rank from greatest solubility to least solubility. triethylamine, dimethylsulfoxide, dichloromethane, acetonitrile, pyridine. Of course, it isn't just salts that can dissolve in solvents. Other solids can, too, if they can interact with solvent molecules strongly enough. Sugar also dissolves pretty well in water. Why do you think that is so? Sugars, of course, can hydrogen bond easily with water, so they are usually pretty soluble.